With 47 percent of hospitality and retail workers currently looking for a new job, the challenge isn’t finding candidates for open positions, but getting them to complete the hiring process, according to a recent survey by StartMonday, an online hospitality and retail industry recruiting platform. The survey delved into an employer’s brand perception from the job seeker’s perspective and how it affects decision-making. Seven hundred fifty non-executive hospitality and retail workers in the U.S. and Canada were surveyed in February. The findings revealed that a company’s reputation is critical to prospective employees, so much so that they will turn down an offer if the company’s values aren’t aligned with theirs. For instance, 45 percent of surveyed respondents said they would drop out of the hiring process if they found out that current employees were unhappy. 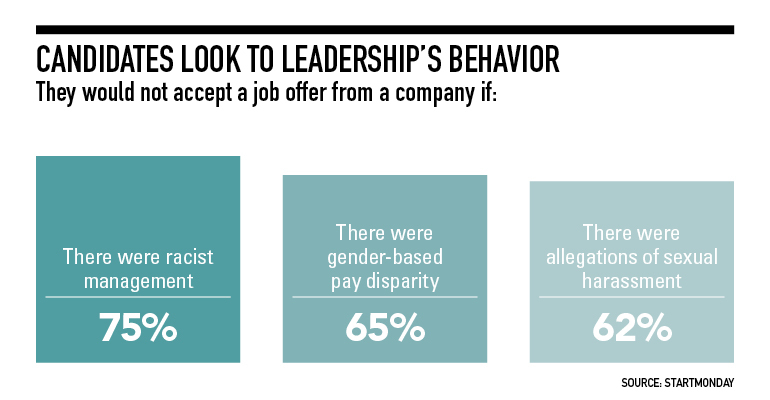 Nearly 75 percent of respondents said they would turn down a job if presented with evidence of racism among management. And 62 percent said they would decline an offer if members of the company had faced allegations of sexual harassment.